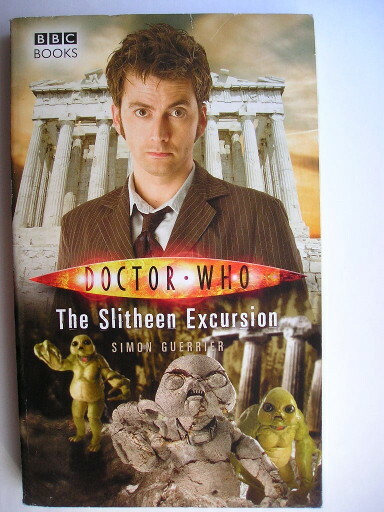 The novel “The Slitheen Excursion” by Simon Guerrier was published for the first time in 2009. June is visiting Greece as part of her classical studies at the university. She’s about to finish her journey and wants to see the Acropolis but during her excursion she sees what appears to be a British Police telephone booth with a man coming out and running towards the nearby caves. Curious, she follows him and sees him animatedly arguing with strange creatures that apparently want to destroy the Parthenon. She decides to intervene and helps him to capture the aliens. June asks for explanations and discovers that the strange man is the Doctor, who doesn’t explain the events but, when he discovers the girl’s interest in ancient Greece, suggests that she travel with him back in time. The idea is to go to 480 B.C. but the discovery of an anomaly in 1500 B.C. leads to a change of plans, especially when the arrival at the new destination occurs with an explosion that leaves the Doctor stunned. “The Slitheen Excursion” is part of a series of novels connected to the new “Doctor Who” series. They’re targeted to a wide audience by being linear enough to be appreciated even by very young readers but sophisticated enough to interest more mature readers. “The Slitheen Excursion” is set in the final period of the Tenth Doctor era, of which only pieces were shown between the fourth and fifth seasons of the new television series, when the Doctor travels alone. In these stories he occasionally has what can be considered temporary companions and in this case there’s June, a university student who’s visiting Greece to see first hand the places of which she studied the history. Simon Guerrier takes another step compared to other authors in the sense that he tells this adventure from June’s point of view. The Greek setting is crucial in the plot, which digs into the mythology since the Doctor wants to take June in the past but an anomaly brings them in 1500 B.C. and at a meeting with King Actaeus, his daughter Aglaurus and other mythological characters such as Cecrops and Deucalion. There they discover a family of Slitheen, whose activities could severely alter the history of humanity. The idea is interesting, its development has some problems. The plot of “The Slitheen Excursion” seems a bit thin to reach the standard length of the novels in this series and some of the protagonists’ movements seem to be fillers that reminds of a classic series adventure, where the Doctor and his companions moved here and there to spend some time and reach a certain duration for the episodes. Simon Guerrier makes up journeys and various movements with the Doctor who repeatedly talks his way out of getting killed, all to get close to the average number of pages for this series of books. The Doctor faced the Slitheen on some occasions in the new television series and they appeared in the spinoff “The Sarah Jane Adventures” as well. With their characteristics they are suitable to comical moments so it’s a good idea to have a story in which the Tenth Doctor has to interact a lot with them. David Tennant was extraordinary in playing those silly scenes but reading them in novels is less effective. Bullfighting is definitely a less typical activity for the Doctor. In reading “The Slitheen Excursion” there’s also a nuisance due to some grammatical errors: perhaps the novel was examined only through an automatic spell checker which can’t detect mistakes such as the incorrect use of “you’re” instead of “your”. I had an impression of a hasty editing. The funny moments and the setting in Greece, with its importance as a cradle of human civilization, are the positive elements of “The Slitheen Excursion”. However, weighing the novel’s merits and flaw, the result seemed to me to be far from exceptional so I think that especially the Tenth Doctor’s fans and Greek history and even more Greek mythology’s fans might like it.